The Fitbit Versa is the company's self-proclaimed "mass appeal" smartwatch, and it's aimed at, well, everyone. Announced alongside the Fitbit Ace fitness tracker for kids, the Versa sports the same PurePulse heart rate and SpO2 sensors you get in the Ionic, but it does so in a much more slender and attractive design. It's also $100 cheaper. 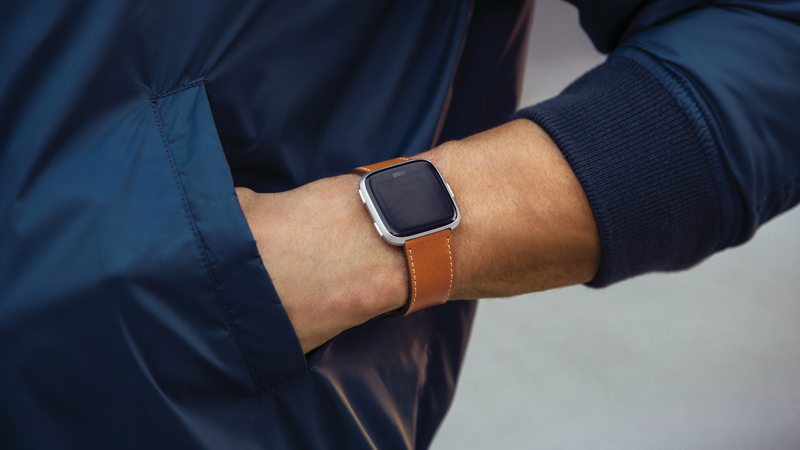 Think of the Versa as a follow-up to the Fitbit Blaze. The watch comes running Fitbit OS 2.0, a new update to Fitbit's smartwatch software, allowing it to run most of the same apps as the Ionic – though there are a few differences to note. There's quite a bit to unpack in the Versa, so we've broken it down for you below. Read on for your guide to everything Versa. The Versa's shape is more squared off than the Ionic and, more importantly, smaller. Fitbit claims it's made the lightest metal smartwatch sold on the US market, and it's hard not to see some Pebble DNA in here. The watch comes with a vibrant 1,000 nit display plus waterproofing up to 50m, so like the Ionic you'll be able to take this swimming. Fitbit sees the Versa's design as the basis of a new design language it can use for future devices. Jonah Becker, VP of design, told Wareable that the company sees the Ionic's angular design as the basis for a "performance" set of products while the Versa's softer, more human design is the basis for more mass-appeal products that can appeal to both women and men. Even the Versa's name is a hint at its design, being short for versatility. Fitbit's designed the watch with a softer look than the Ionic, from the buttons on the side to the heart rate sensor underneath. Fitbit calls the case shape a "squircle" – yes, really – softening the hard edges of a square with rounded corners to make it feel more inviting. The Fitbit Versa will come in three colours: all black, grey and rose gold. There are also two special edition models in graphite, with a charcoal grey band, and rose gold, with a lavender woven band. Plus, Fitbit is partnering with the Council of Fashion Designers of America to fund emerging label PH5, which will offer knitware bands and accessories for Versa. Fitbit itself will also offer bands. The standard silicone bands will retail for $29.95, Horween leather bands will go for $49.95, mesh bands will be available for $79.95, and metal link bands for $89.99. While the heart rate sensors are identical to the Ionic, you don't get built-in GPS with the Versa, so you'll need to have it paired to your phone if you do want to track your outdoor workouts. But just like the Ionic, you'll get space for 300 songs on the device, as well as the option of music apps that vary depending on your location. Fitbit's Deezer partnership is going global, while users in the US also get Pandora (sorry, Europe). When it comes to Fitbit Pay, the company's wearable payment service, the situation is a little… strange. All Versa watches in Europe and Asia will come with Fitbit Pay onboard, but in the US you'll need to get the $229.95 Special Edition Versa to get the feature. Why the discrepancy? Melanie Chase, Fitbit's VP of marketing, told us the reason is that adoption for NFC payments has been slow in the States. It feels like a mass appeal smartwatch adding NFC payments would help spur adoption, but apparently that's not how Fitbit sees it. Fitbit says you'll get over four days of battery life, which is just a little under what the Ionic offers, but still pretty good when put against the big smartwatches on the market. Fitbit OS 2.0 is also coming with menstrual tracking, which Chase says was one of Fitbit's users' most requested features. You'll be able to log your cycle and record symptoms like headaches and cramps. Fitbit came up with a new algorithm that looks at all this data and predicts where you are in your menstrual cycle and when the next one is coming. Fitbit will also start giving users guidance for menstrual cycles, ovulation, fertility and tips to debunk common misconceptions. There will also be groups in Fitbit's Community service for women to connect over. In the future, Fitbit hopes to use all this menstrual data to offer insights about how sleep and exercise impact your period and vice versa. For instance, it could recommend more sleep in the coming week because a bad period is on the way, or suggest easier ways to exercise if you're feeling too tired. Menstrual tracking will also make its way to the Ionic in spring 2018 – and is only available to Fitbit users who identify as female. As mentioned, the Versa marks the debut of Fitbit OS 2.0, a significant new update to Fitbit's smartwatch software. The biggest addition is something called the Fitbit Dashboard: swipe up from the bottom of the Versa and you'll see your activity, heart rate, tips and tricks, guidance, weekly and daily health and fitness stats and exercise summaries. Essentially, Fitbit has replicated the smartphone app's dashboard on your wrist. Later in 2018, Fitbit will roll out an update that it says will let the dashboard personalise itself to you over time. There'll be reminders to log your food intake or take medication, celebrations for hitting goals and milestones, insights into your activity, sleep summaries, social challenges and prompts to take action on your data. Fitbit OS 2.0 will also add the ability to reply to messages directly from your wrist, but only on Android. Melanie Chase says the closed nature of iOS doesn't allow them to offer the same functionality, but that it's looking at workarounds for specific apps like WhatsApp and Facebook Messenger. Chase said Fitbit wants these reminders and guidance to feel like the company is having a conversation with you about your health and fitness, rather than it nagging you to hit your step goal. The Versa is available for pre-order now on Fitbit's website for $199.95 and will start shipping in April. If you want the special edition version, that costs $229.95, but in the UK that's only going to bag you the extra woven band, while US owners will need to get the special edition in order to get Fitbit Pay. The Versa will be available from big retail stores like Amazon, Best Buy and Target. When Fitbit says that NFC adoption has been slow in the United States, I'm guessing they mean, "retailers have been slow to accept NFC payments, so there's no point in putting it in a watch." In Canada, there are a handful of national-level banks that pushed us forward on secure credit-card technologies. In the US, there are a ton of small, local banks, and they haven't been able to compel businesses to adopt PIN codes or NFC readers. It gets better every year, but it's been very slow on the uptake.